Rhode Island high schooler leads class, despite speech struggle. Eric Duquette is the salutatorian of his high school, an honor student, a musician, and he has autism. The 18-year-old Duquette, who couldn't say a word until age five, gave the commencement speech at his high school graduation ceremony Tuesday night in Smithfield, Rhode Island. "My parents were told I would most likely end up in an institution," said Duquette. "I stand before you accepted into every institution of higher learning I applied to." He stood at the podium wearing a green cap and gown and a big grin on his face. His speech, funny and touching, was met with enthusiastic applause from his peers. Watch 'World News' for more on Eric Duquette's story tonight on your ABC station. Duquette graduated from Smithfield High School with the second-highest grade point average in a class of just under 200 students. He will attend Rhode Island College in the fall, with plans to study biology and eventually become a pharmacist. "Tonight is all about reflection and looking forward to the journeys that lie ahead of us," he said. It's been quite a journey for Eric. His success in high school came after years of work and slow progress. Diagnosed with autism when he was a young child, Duquette struggled with communication and language. His mother, Judith Duquette, began working with him early to break down his communication barrier with speech therapy. In addition to professional therapy, mother taught son using sign language and cards with pictures and symbols. Despite his early struggles with speech, today he speaks both English and Spanish. He's a member of the Spanish National Honor Society and placed 93rd in the nation on the Spanish V exam. 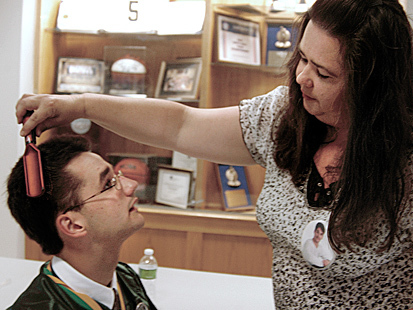 Judy Duquette combs her son Eric's hair before he delivers his graduation speech. "Daniel Webster wrote that 'if my possessions were taken from me with one exception, I would choose to keep the power of communication, for by it I would soon regain all the rest,'" Duquette said at the podium. "For me, learning to communicate did mean regaining all the rest." Listing the scholarships and college acceptances he's received, Duquette said that he hoped to inspire his fellow students. "I tell you this so you do not allow yourself or others to be defined by your limitations but rather abilities. Never underestimate yourself," he said. 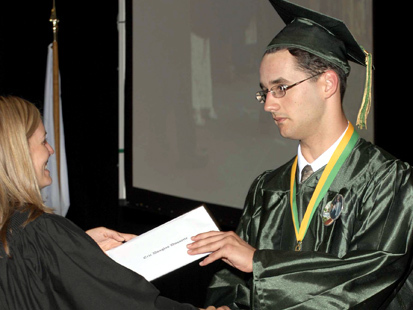 Eric Duquette, 18, receives his diploma during the Smithfield High School graduation ceremony on June 15, 2010. After the ceremony, Duquette told ABC News he was proud of his performance. "I think I perfectly encompassed the compassion and spirit of Smithfield High School through each and every single one of my words," he said.